I recently saw an ad which said: "To the Rescue: The Biography of Thomas S. Monson. Pre-Order Today - Will ship when available. To the Rescue is the much-anticipated official biography of President Thomas S. Monson." Most everyone in Utah knows that President Thomas S. Monson is the Prophet of the LDS "Mormon" Church. So is God going to play a joke on the Mormons? At each Conference, the Mormon leadership is sustained as prophets, seers, and revelators. And to me it appears that God has not sent anyone of those 15 leaders "To the Rescue." What are we to think when MILLIONS OF "Mormons" and their little children are killed with this Nuclear War on our doorstep. Is God the hypocrite, or someone else? Why would God reveal to a sinner in Parowan, Utah, what he doesn't to a man that has spent his life "To the Rescue" of others? And what about the other deaf/mutes who claim the same title as prophets, seers, and revelators? Are they all asleep too? How come nobody can see the signs except a crippled sinner here in Parowan. The Doctrine and Covenants 68:11 says they should know about the war coming to rescue their members. A friend of mine sent me this email tonight 12/19/2010 about the Drudge Report that he saw today. So I am posting it on my web site. and seems to echo the words of the Parable Leland received March 29, 1997, as another partial fulfillment of prophecy. The part below in green, being the similar portion. At this point it seems It will not be long before the rest of the parable is also fulfilled. Floods and fire, the world's a zoo (You go to a Zoo to see WILD animals. (Dumb sheep, or ignorant people lulled into carnal security by the devil, and their church leaders being deceived that "all is well," they trusted blind dogs, and were happy to do so. They do not see the shackles with which they have bound themselves, and go mindlessly to their death.) Matthew 13:30 tells the TARES will be bound. Don't repent and give the glory to God. That is the end of just "one" Parable Leland had spoken years ago. 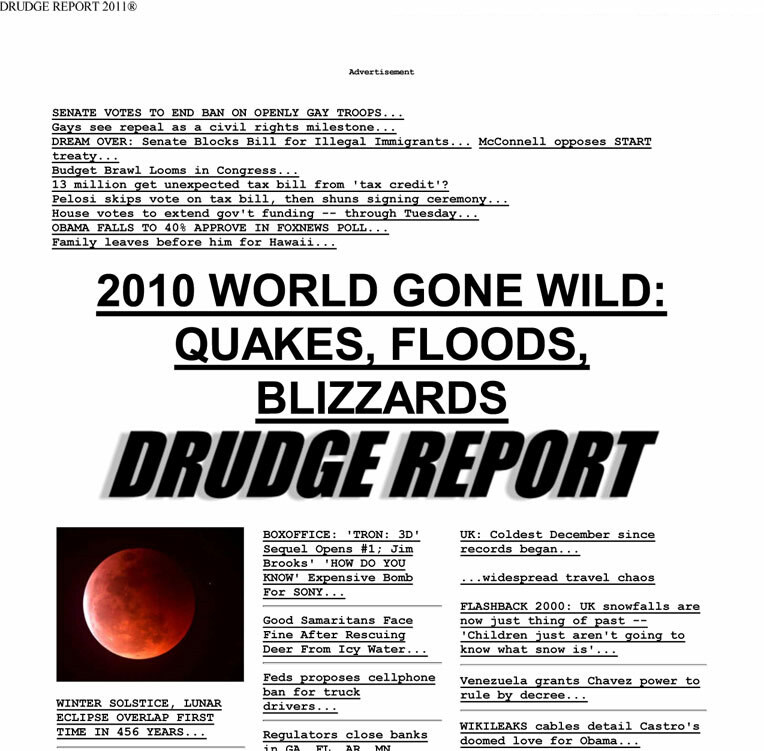 So it is becoming more and more evident that world events are "naturally" bringing into play the things that God has foretold through one of His prophets, in these parables more than 13 years ago. Knowledge and preparation are key to surviving these terrible events that have been forecast upon us. One might say by such revelations as these that: "our days are numbered!" And Australians expecting to bask in early summer sun this Christmas are instead shivering as icy gusts sweeping up from the Southern Ocean have blanketed parts of east coast states New South Wales and Victoria with up to four inches of snow. That is the 1st. day of summer for them. December 21st. in the southern hemisphere. So the World has gone wild. 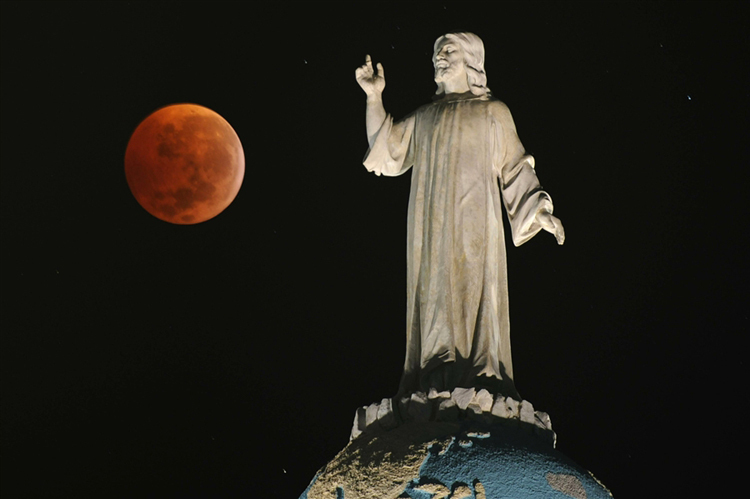 The Prophet Joel 2:31said the Moon would be RED BEFORE the Great and Terrible Day of the Lord. So are you ready for the heathens to be destroyed? WASHINGTON � Tuesday 12/21/2010 After knocking on 50 million doors and handling tens of millions of surveys, the Census Bureau on Tuesday announced that the official population of the United States is now 308,745,538 Are you really ready for 100 million people to die in 2011? Because they will argue with God's commandments. "The first angel sounded, and there followed hail and fire mingled with blood, and they were cast upon the earth: and the third part of trees was burnt up, and all green grass was burnt up." Revelation 9:18 "By these three was the third part "of men" killed, by the fire, and by the smoke (fallout) and by the brimstone, (radiation) which issued out of their mouths." Reader did you notice the 2nd. line in the Parable above: "Floods and fire, the world's a zoo"
Read Psalm 79 about THE HEATHEN defiling the TEMPLE and God's anger. Also Psalm 97 about mushroom clouds, and Fire, and REJOICE. New Moons for 2007 In 2010 it will be on Thursday April 15, in the West 8:15 to 9:47 pm Utah time here in Parowan Utah 84761 The TRUE Sabbath for the rest of the year begins every Thursday at Sundown till Friday at Sundown. Exodus 12 tells when the year begins on the 1st. day of the 1st. month. We (8) people just saw the NEW Moon at 8:15 p.m. out West. 4/15/10 so the true Sabbath will begin every Thursday at Sundown; from tonight till a year from now. On the Internet @ 9: 03 p.m. 4/15/ 2010 updated! Just a few minutes age on Tuesday March 20, 2007 from my home here in Parowan Utah at 9:00 p.m. we got these pictures of the "New Moon." Just out in my front yard. Just that easy to keep God's commandments. Venus the Star is in the upper left at 9 pm March 20, 2007 and the Moon in the lower right. you be fleeing this winter on Friday, that is the Sabbath till Sundown?